If you need to carry more than one cable to charge your different mobile devices, cameras, headphones and other peripherals. You may be interested in a new certified tri-connector charging cable which has been created called Rebel which builds on design of the previous Python charging cable. The Rebel charging cable is available to back from just $12 with shipping expected to take place during October 2017 if companies crowdfunding campaign is successful. Watch the video below to learn more about the construction and design of the tri-connector charging cable. Python is the world’s first charging cable with Tough Kevlar® Reinforced Braided PVC Skin for superior strength and a lifetime warranty. Python is Universal, Certified, Strong, Fast, Durable, Reliable and Lasting. 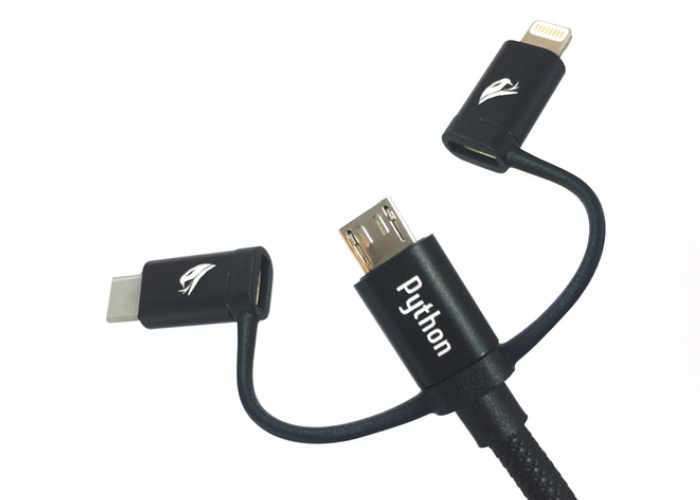 Python cables are available in several dynamic lengths. Python is the world’s longest Apple MFi certified cable. We stand behind our product 100% and back it with a lifetime warranty. Not the least expensive, not the most but far better than other cables costing a lot more and simply delivers lasting value. Over 10,000-user tested and recommended. For more information on the new Rebel Tri-Connector charging cable jump over to the Kickstarter website for details by following the link below.